An international team of astronomers, led by astrophysicist Alex Lobel of the Harvard-Smithsonian Center for Astrophysics, announced at the 201st meeting of the American Astronomical Society in Seattle that they have observed a huge eruption by a hypergiant star that blasted nearly 10,000 times the mass of the Earth into space. During this spectacular event in the year 2000, the star Rho Cassiopeiae (in the constellation of Cassiopeia) lost more mass than in any other stellar eruption observed by astronomers. During the outburst the star brightened briefly, then dimmed for a period of months. The initial brightening occurs when gases fall in towards the star and are compressed and heated. Then, that material blasts outward and the star dims. It is a dramatic process, comparable to jumping on a trampoline, where the atmosphere drops downward only to shoot upward again. The team advises that another eruption could take place at any time. Continued observations show that the colossal atmosphere of Rho Cas has remained unsettled in the aftermath of the outburst two years ago. Since Rho Cas is bright and visible all year to astronomers in the northern hemisphere, it can be seen easily even without a telescope. It is a promising target for amateur observers, who can monitor it for the next explosion and report their findings to the Central Bureau for Astronomical Telegrams. Rho Cas is a member of a rare breed of stars called hypergiants, of which only about a dozen examples are known in the Milky Way Galaxy. Larger and more massive than the Sun, they pump enormous amounts of light into space. Rho Cas is visible to the unaided eye despite its great distance of some 10,000 light-years, because it is over 500,000 times more luminous than our Sun. 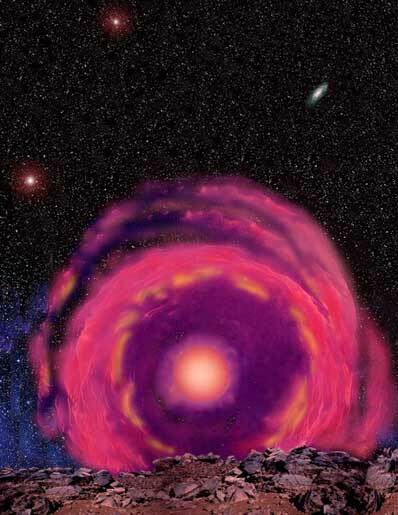 Rho Cas interests astronomers not only for its size and luminosity, but also for its behavior. In 1946, astronomers were astonished to see the star dim by a factor of six from fourth to sixth magnitude, and alter its spectral type from F-class to M-class, indicating a drop in surface temperature from 12,000 degrees Fahrenheit (7,000 Kelvin) to 5,000 degrees F (3,000 K). Astronomers recognized that they had seen an explosion on the star's surface, but could not determine the size of the explosion. The international team caught Rho Cas erupting in the year 2000 and calculated the amount of mass lost by carefully studying the star's light. They split that light into a spectrum of colors, similar to the way that sunlight passing through a prism creates a rainbow. The scientists then created a computer model that matched the observed spectra. The model showed that the star had explosively ejected enough material to equal 10,000 Earths. Dark bands appeared in the optical spectrum of Rho Cas, showing that molecules not normally present were forming in the star's atmosphere. "These peculiar spectral bands were also temporarily observed when Rho Cas dimmed suddenly in 1946. We know now that the star produced these molecules because its outer atmosphere cooled by more than 3,000 degrees during the outburst. A tremendous amount of gas was ejected - lifted into space by a blast wave, similar to the loud shock wave or 'sonic boom' you hear when a supersonic aircraft flies past," said Lobel. "The shock wave, of course, was much stronger and wrapped around the entire star, blasting huge quantities of gas into space." Because Rho Cas is bright and required constant monitoring, the team observed it using five modest-sized telescopes in the U.S. (at Oak Ridge Observatory, Mass., and Ritter Observatory, Ohio) and Europe (the William Herschel Telescope and Nordic Optical Telescope on the Canary Islands, and the Special Astrophysical Observatory in Russia). For nearly a decade, they regularly studied Rho Cas to watch it for any changes. "We were exceptionally lucky to witness a stunning explosion in Rho Cas and to have acquired the spectra to make a quantitative analysis possible," said Smithsonian astrophysicist Andrea Dupree, a member of the team and second author on the paper reporting their results. By monitoring Rho Cas, astronomers are trying to solve one of the most enduring riddles of stellar physics: Why are there no stars that are more luminous than about a million Suns? Based on the observations of Rho Cas, their calculations show that a shock wave blasting from such a star can only travel so fast and far before losing its punch because the star's atmosphere produces huge amounts of hydrogen atoms. When these hydrogen atoms are formed, a small amount of energy is released that helps to push the shock wave outwards. The inflating atmosphere cools even more and yields an avalanche of gas expelled by the star. This explosion on Rho Cas demonstrates how unstable these hypergiant stars are. Lobel conjectures that such recurrent mass ejections prevent them from sustaining such large luminosities. "This process makes the atmosphere of stars with a surface temperature like our Sun-but pouring out about a million times more radiation-very unstable. More luminous stars don't make it for long. We don't get a chance to find them because they perished in their galactic cradles long ago, or because they no longer shine as brightly as they once did," said Lobel. Astronomers predict that Rho Cas will perish in a supernova explosion as it rapidly uses up the nuclear fuel at its core. When that final catastrophic blow arrives, it will rip the entire star apart in one last blaze of glory. A paper on the team's research will be published in the February 1, 2003 issue of The Astrophysical Journal. This research was supported by NASA and the Smithsonian Astrophysical Observatory. The science team mentioned in this press release consists of Drs. Alex Lobel, Andrea Dupree, Robert Stefanik, and Guillermo Torres (Harvard-Smithsonian Center for Astrophysics, Mass. ), Garik Israelian (Instituto de Astrofisica de Canarias, Spain), Nancy Morrison (University of Toledo, Ohio), Cornelis de Jager and Hans Nieuwenhuijzen (Space Research Organization of the Netherlands, The Netherlands), Ilya Ilyin (University of Oulu, Finland), and Faig Musaev (Special Astrophysical Observatory, Russia).